More than a year ago, when this blog was barely just a twinkle in our eye — OK, so maybe it was a little more fully-formed than that, but you understand what we’re trying to say — we fully embraced the very of-the-moment goat yoga trend. We essentially created a photo gallery of said trend, a digital era totem to a happy world in which tree pose and baby goats could exist within the same moment. You wanna talk leaning in? Yeah, we totally leaned in to the goat yoga thing. And we have absolutely no regrets about it. But we’ve realized recently that in our enthusiasm about goat yoga, we kind of dropped the ball on an equally adorable, even more on-brand subset of the yoga universe that the world just needs a whole lot more of. Dog yoga. We need to talk about dog yoga. According to an April 2018 article in TIME, dog yoga is a practice available worldwide in which human yogis are encouraged to bring their canine companions along for class. 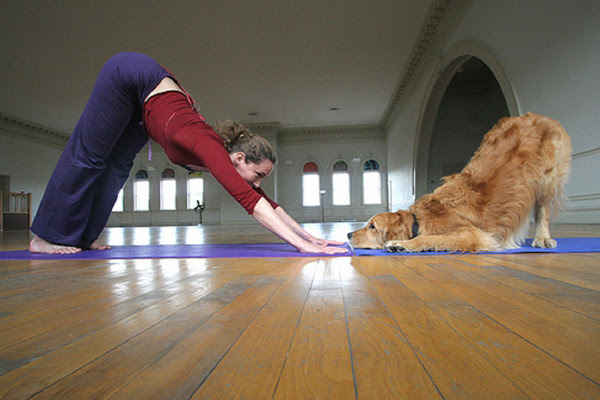 “And while not every canine understands quite how to tackle the contortions of every pose — outside of the iconic downward dog position, of course — the addition of dogs to the studio space helps owners get in touch with their breathing as they go through the flows and gives them an activity to share with their pets,” TIME notes. It’s also just incredibly cute. 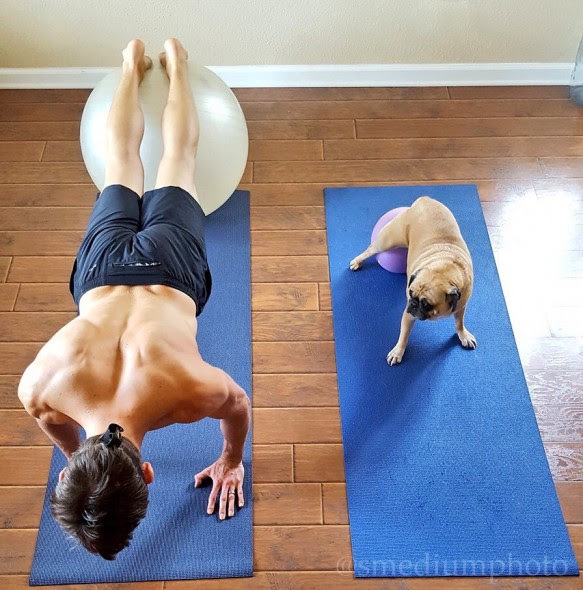 In that spirit, keep scrolling for ten dog yoga photos that made us go all heart eye emoji. Did you really think we could pull this off without a down dog reference right off the bat? At first glance, we truly believed that this photo had to be fake, but we’ve reviewed it extensively and are seeing no signs of a Photoshop job. Also, both of these individuals have cores that won’t quit. What we appreciate most about this Pug is that he’s clearly concerned with his form, but isn’t freaked out about trying to be perfect. It’s all about progress, bud. 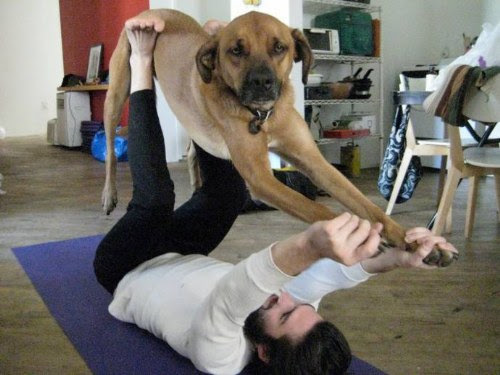 We’ve always been big believers in the fact that yoga is for every body, and the same apparently goes for dogs. There’s room for every breed to get involved! 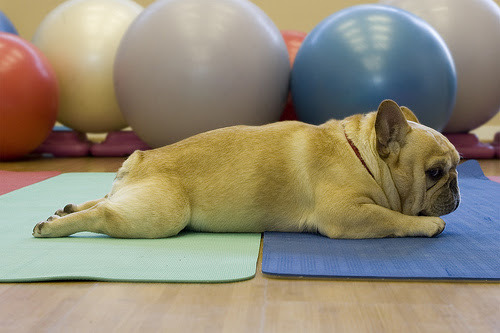 This Bulldog (obviously) understands that sometimes, all you want when you hit the mat is a good stretch. Again, we ask — is this even real? Some dogs just phone it in during their yoga practice, but not Secret. This dog is amazing and 100 percent worth an Instagram follow. Yoga is only the beginning of her list of skills (though it’s obviously our personal favorite). 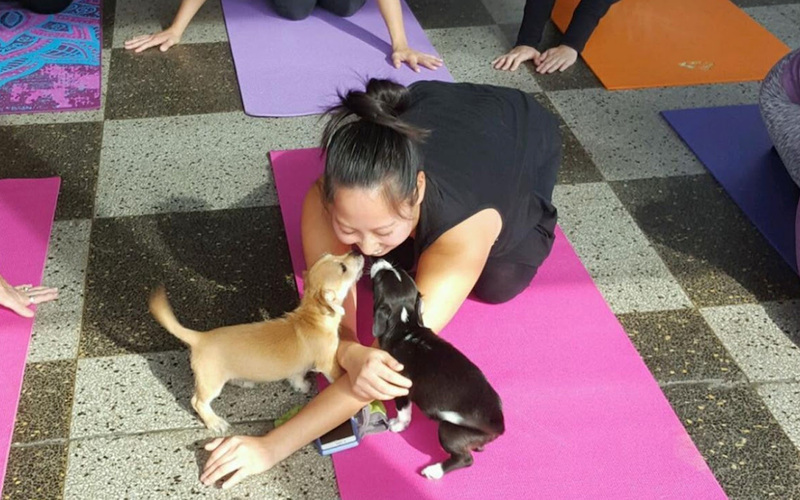 As if you needed one more reason to love dog yoga (and we doubt you do), picture this: you pause to take a break and catch your breath in the middle of an especially challenging flow, and there are two puppies there ready to lick your face. Honestly, the only downside here is that you might struggle to get back into your practice. Fun (and little-known) fact: the weight of a small Corgi puppy is often exactly what you need to push your bridge pose to the next level. The final rest you get after a particularly grueling practice is already pretty sweet. Imagine adding dogs… in shirts! 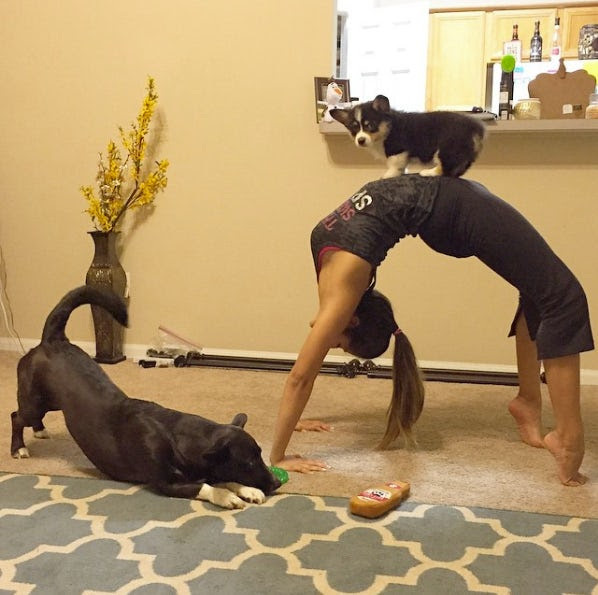 Which dog yoga pic is your favorite? Tell us on Facebook + Twitter!